How Clive Davis Shaped 'The Soundtrack Of Our Lives' The music mogul has spent decades shaping the careers of artists who would grow into superstars. A new Apple Music documentary aims to tell his story. 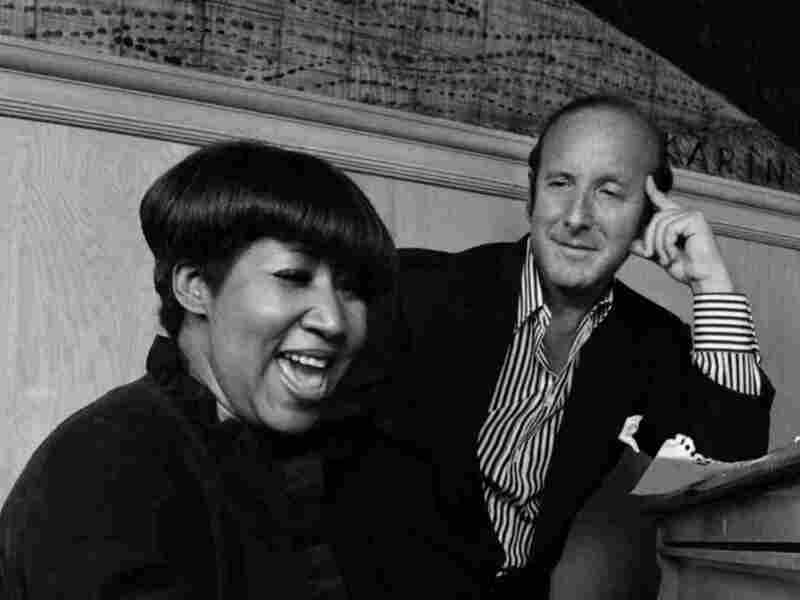 Clive Davis with Aretha Franklin in 1981. Bruce Springsteen, Alicia Keys, Billy Joel, The Notorious B.I.G., Whitney Houston, Carlos Santana. Few people can even claim to have met this many musical greats — let alone be responsible for jump-starting their careers. Clive Davis has played quite a few roles in the music industry. A Harvard Law graduate, he has been a record producer, A&R executive and, for many years, president of Columbia Records. He's also won five Grammy Awards and was inducted into the Rock and Roll Hall of Fame (as a non-performer) in 2000. Today, at 85, he is Sony Entertainment's chief creative officer — and the subject of a new documentary. Apple Music released Clive Davis: The Soundtrack of Our Lives on Sept. 27. Davis joined NPR's Robert Siegel to talk about signing Janis Joplin, his close relationship with Whitney Houston and what he looks for in a breakthrough artist. Hear the radio version at the audio link, and read on for an edited transcript. Robert Siegel: In the film, you say that you had zero music experience when you went from being the lawyer for Columbia Records to being its president. How did that happen? Clive Davis: I had no connection with music whatsoever. It was only after I was head of the company for about a year I found myself at the Monterey Pop festival in the presence of Janis Joplin and Big Brother and The Holding Company, and that was my epiphany, that was my first signing. I started trusting my instinct after that which led to Blood, Sweat & Tears and Aerosmith. And when you're at the Monterey Pop festival, you're the suit in the audience. You're the guy out of place. It wasn't a suit, it was khaki pants and a tennis sweater. Yeah, I was the odd man out in that audience, that's for sure. What was it that you heard in Janis Joplin that right away made you feel, "I've got to sign this?" She was riveting, compelling — killer voice that just vibrated through you and sent shivers up your spine. The documentary depicts your intervening in the careers of a number of artists — first hearing the future success in what they're doing and then making some adjustments to make that success come faster. How do you describe what it is that says to you, this one, as opposed to that one, could be a real success? You know, it's different if you're a writer. It's different when you're signing a Bruce Springsteen or an Alicia Keys than it is when you're signing a performer, a Whitney Houston, or feeling that Aretha or Dionne Warwick could still be major stars for many years to come. You're looking basically for headliners. You're looking for those that will lift an audience out of its seat. The artist who occupies the most time in this film about your career is Whitney Houston: a spectacular success story, a catastrophic end to that story. What was your relationship with her? My relationship with Whitney was that I signed her when she was in her teens. We bonded to the point that her management insisted that I give them a team-end clause that I had never given any other artist before or since — which meant that if at any time I would leave the company, she would have the right to leave. And so we had a very close creative relationship. I was with her just two days before her death. When her drug problem became so serious and ultimately fatal, was it hard for you to see because you were so close to her? Do you think you were perhaps trying not to see it? I think that the film points out that I initially did not see it up close — because Whitney would, before she saw me, be dressed great, look great, be on top of her game. But when I saw the problem, [the film] shows the letter that I wrote to her and goes into the detail of the efforts to really get her to confront her addiction. And when she did that Oprah interview, we all thought that she had beat the problem. But obviously, she did not. You are currently the chief creative officer of Sony Entertainment. I'm curious: If you listened to some music this evening that had nothing to do with work, that was entirely for pleasure, what would you listen to? I wish I had that opportunity — because every week I bring home the new records as they break through to study why they're hits, to study why radio was playing it, what radio was not playing, to make sure I don't come with self-confidence. I don't want to go over the hill, and so I keep my ear very, very current every week. Web intern Steffanee Wang contributed to this story.